Sigma Beauty Affiliate Program: New Product Sneak Peek! The most advantageous time to boost your affiliate commission is during the first week of a new product launch. In November and December, we are planning to launch FIVE new products and this is a great opportunity for you as an affiliate! We want to share the product release dates and a brief description of the new products. Plan ahead and take advantage of this chance to increase your sales! The Cities is Sigma Beauty’s special edition travel kit collection! The kits feature seven travel-sized brushes from our best selling Essential and Premium Kits (E05 Eyeliner, E35 Tapered Blending, E45 Small Tapered Blending, E60 Large Shader, F05 Small Contour, F15 Duo Fibre, and F30 Large Powder). The brushes are held in a travel-size container that turns into two brush holders to keep your brushes organized, even on the go. Each kit was designed to represent the beauty and excitement of the city it is named after. There are four kits in this exciting collection: London (brown), Tokyo (pink), Paris (red) and New York (black). The Sigma Beauty Make Me Up Travel Kits were designed for fun, yet practical makeup application on the go. Similar to the design of the full sized Make Me Up Collection, these travel sized kits contain seven colorful brushes held in a functional and stylish container (E30 Pencil, E40 Tapered Blending, E55 Eye Shading, E65 Small Angle, F30 Large Powder, F40 Large angled Contour, and F60 Foundation). The kits will be available in Black, Aqua, Coral and Purple. The Bunny Collection is Sigma Beauty’s vegan friendly line of brushes. The collection will feature a full-size and travel-size kit. The full size kit will contain the twelve brushes sold in our Essential Kit, all made with the Sigmax HD fibers. The travel-size kit contains seven best selling brushes from the Essential kit. Both kits will be held in a Sigma Beauty container that turns into two brush holders. The Sigma Beauty Extravaganza Face Kit is a lavish assortment of one of a kind, hand-crafted brushes with 18 karat gold-plated ferrules. 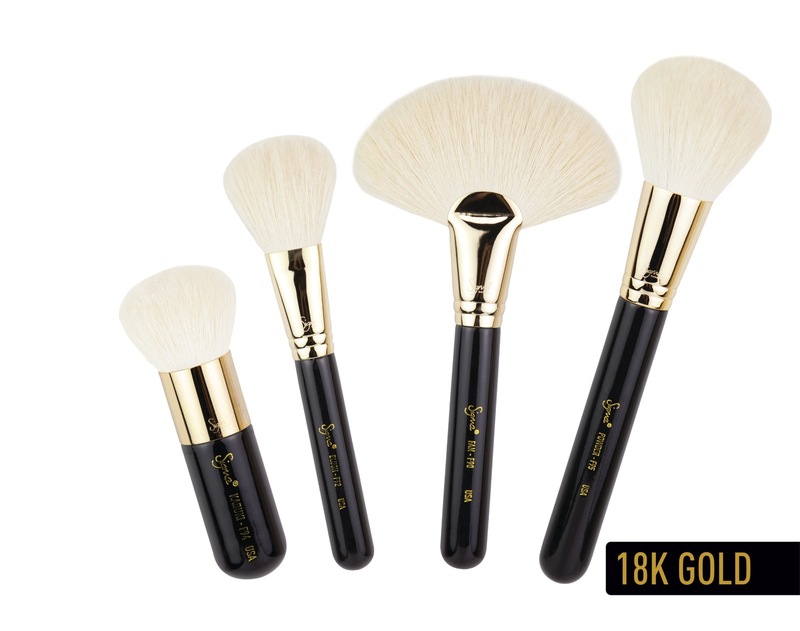 The face kit features four gorgeous, 18K gold-plated brushes and a deluxe carrying case, perfect for traveling and storage. The Sigma Beauty Extravaganza Complete Kit features 29 of our best-selling essential, premium and individual brushes. The brushes in this collection are hand-crafted with 18 karat gold-plated ferrules, specially designed to deliver a luxurious makeup application. We will be posting more information, pictures and new affiliate banners on each of the specific release dates. Take advantage of this great opportunity to boost your sales! I can't wait to post this products on my blog. And I thought my sigma wishlist was big enough. Omfg. Love the extravaganza, the cities, and the bunny one. Meu Deus , quanta coisa linda!!! Adorei as novidades, e não vejo a hora de postar tudo no blog! WOW!! Gotta love Sigma!! Just posted about it on my blog: http://beautytipsbycah.blogspot.com/2011/11/lancamentos-de-final-de-ano-da-sigma.html YAY!!! Wow! There has been so much in the works lately with Sigma and I have to say that I am insanely impressed with it all from the past releases of the dry n' shape and to the recent release of the new Sigmax brushes and precision Sigmax brushes to these upcoming releases. All of these sets look absolutely amazing and I, for one, can not wait to get my hands on them! Great Job Sigma! I look forward to your upcoming releases! WOW!! The brush sets look amazing!! I am looking forward for the release and will get a brush set! Las quiero! Me parecen unos kits estupendos! Seguro que arrasan. Oh dearest Sigma.. You guys are genius! Never stop to amaze your fans! YOU GUYS ARE A GENIUS! Never stop amaze me with all of your beautiful product! Love them! The Bunny collection is so cute! Omg! Are beautiful! I share this news with my readers? hello, I wonder what price will the bunny collection kit and if he is there in that color. Maravilhosos, aguardo ansiosamente pelos Banners! @Flo-MakeUp Yes, please feel free to share with your readers!!! @Mireia Please visit the blog on December 5th, 2011 for more information about product details. Tudo de bom a novidade!! Adoreii!! Che belli, il set da viaggio poi è fenomenale! OMG! all the brushes and sets are goooorgeous! Já posso deixar as leitoras um pouco curiosas??? Eu amei, tenho certeza que será um sucesso enorme!!! Wow...I have some work to do now to keep my readers updated! Wow cant wait for the release, im dying to get some of this new collections!!! Great News, I'm looking forward to announce their launch! Esse The Extravaganza Complete Kit é de cair o queixo duas vezes!!! OMG! *_* I love The Extravaganza Face Kit! Amazing! Amei todos!!! O que significa que quero todos!!! hehehe Ai, que dúvida!!! Great work, Sigma!!! Ooh, I'm going on a one month long holiday, the travel kits would be so useful! Estou ansiosa pelos lançamentos!!! Estarão em meu site com certeza! Ahh, eu quero todos! Amei. Oh my gosh, these are gorgeous! I love the idea and design!! Wooow!!! It's amazing!!! Can't wait for them!!!! Very nice sets. Love the idea. Can you already name the prices? Are there any discounts for affiliates available - not for promotion just to purchase for presentation or maybe a prize draw? Adorei tudo, parabéns Sigma pela criatividade, sempre inovando. Meuu Deeuus... The Bunny collection!!! Nossa que maravilha,super amei queria todos é um sonho,farei já a postagem. @Magi Please check the website for product details on the products release date. dont know what to say! i want all of it!! specially the bunny and the cities one. love the color! O post com o realese ja vai sair no meu blog! Ahhhhhhhhhh eu amei,que tudo de bom!!!!!! Farei a postagem tb.. tudo tão lindo .. eu kero!!!! WOW!!!! They are all gorgeous!!! And the idea of launching them for the Holidays is pretty cool! Just wrote about these new products in a Xmas gift ideas post series in my blog! I BLOGGED ALREADY ABOUT THIS FANTASTIC BRUSHES! I CANT WAIT TO BUY THOSE! The Extravaganza Complete Kit is just so amazing. It would be an awesome set for any girl that absolutely loves playing with makeup and understands the importance of good brushes.. or even for an aspiring makeup artist! Thank you for your answer Sigma :) I will definitely follow the blog to stay updated. WOW! I loved it so much .. I want now! Estou curiosa p saber os preço dessas belezinhas!! Super excited about these products! Especially the bunny collection! Wow! The Bunny Collection and Extravaganza Complete Kits look really pretty and glam! Loving these! Will be sharing them on my blog soon! @Quelita Nunes The prices will be posted at the date of the product launch! What color are the other in the bunny set? Black handles with pink? @Samantha The other set in the Bunny Collection has black handles and silver ferrule! OMG! They are so gorgeous! I want it all. It's a pity I live in Brazil and the products take so long to get here. Estou tentando me cadastrar no site para ser uma afiliada, porém não consigo cadastrar meu e-mail, ja tentei com os três que tenho, e simplesmente não entra no site. Alguém poderia me ajudar a respeito? @Renata Lopes Please contact affiliate@sigmabeauty.com for additional help.